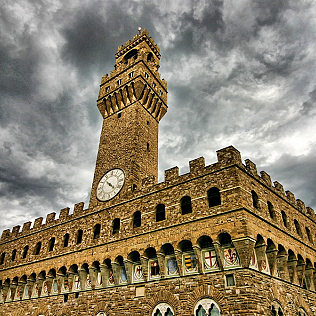 Palazzo Vecchio was designed and realized in 1299 by Arnolfo Di Cambio as the seat of the Priori delle Arti e della Signoria of Florence. It became the temporary residence of the Ducal family of Cosimo I de\' Medici and then the seat of the Royal Family. The intriguing Monumental Quartes, that shows the private and professional life of the Royal family, can still be visited nowadays, richly frescoed by Giorgio Vasari in the 16th century. The Palace was built with a lot of secret passages in order to reach different rooms without being seen, as the Studiolo of Francesco I de\' Medici, a small room without windows, or the Starway of the Duke of Athens, built into the depths of the walls to escape from his apartments. It\'s interesting to vist the Camerino of the Duchess Bianca Cappello, second wife of Francesco de\' Medici, from which one could observe in secret what happened in the adjacent magnificent Salone dei Cinquecento (Hall of 500), the most impressive hall of the building, realized in 1494 by Simone del Pollaiolo, that took its name from the Council of Five Hundred which met here. Palazzo Vecchio is still a functioning civic government building.